Will this be The Year Poutine Broke in Philadelphia? 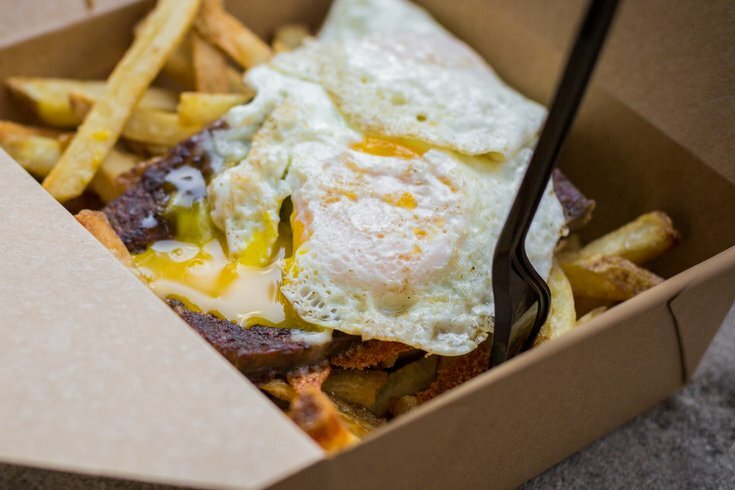 The Scrapple Jawn features scrapple, cheddar cheese and a fried egg placed on top of fries. One of the great fast-food success stories is the journey of the french fry. Once a mere Robin to the hamburger Batman, the french fry has risen to become a Batman in its own right. So there are two food Batmans. Point is, fries have become a meal in their own right, thanks to the addition of things like cheese, chili, sour cream, different cheese and, of course, bacon. Fries are now a blank slate for whatever you want to throw on top of them. 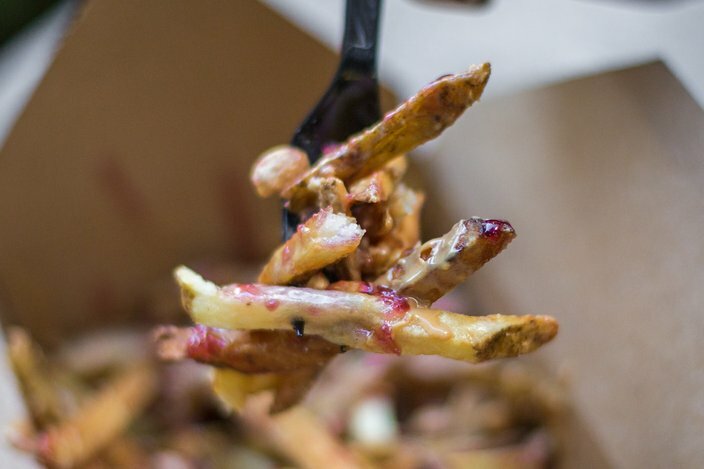 Our neighbors to the North have been throwing stuff on top of fries for decades, of course. In the 1950s, Quebec — Canada’s Frenchest province — invented “poutine,” a dish featuring fries covered in cheese curds and brown gravy. Cheap, hot and delicious, poutine became a national sensation, earning its place as one of Canada’s signature foods. North of the border, you can order poutine at Wendy’s, Burger King and McDonald’s. The carb-heavy dish has trickled its way into America over time, but this could be the Year Poutine Broke here in Philadelphia, with the upcoming openings of Canadian chain Smoke’s Poutinerie on South Street and two locations from local startup Shoo Fry — one coming soon to Fishtown and another that just opened in Rittenhouse (132 S. 17th St.). In addition to various sliders and milkshakes, Shoo Fry has multiple varieties of poutine available. There’s the classic curds ’n’ gravy, a jerk chicken variation, one covered with pulled pork and barbecue sauce — even a spin on the local favorite creamed chipped beef dish called Shoo On A Shingle. And yes, there’s a cheesesteak poutine. While those sound great, this is Bad For You, which means I was assigned to eat the two weirdest things on the menu: the peanut butter and jelly poutine and the Scrapple Jawn, made with scrapple, cheddar cheese and a fried egg. Grape jelly on french fries. The Scrapple Jawn is named so because this is Philadelphia, where we eat scrapple and say “jawn.” While I do say “jawn” and fit the Philly stereotype with my love of cheesesteaks, I must admit, I don’t care for scrapple. Scrapple has to be one of the least appetizing names for a food maybe ever. It’s called that because it’s literally scraps of whatever unused pig parts are lying around. Describing its preparation, the Wikipedia page for scrapple contains the line, “The mush is formed into a semi-solid congealed loaf,” which sounds like something I don’t ever want near my mouth. To my surprise, however, I enjoyed the Scrapple Jawn quite a bit. For one thing, the fries were on point. They had a brown coloring, which might be the result of being fried twice, though that’s just a guess. They were salted perfectly and had the right amount of crunch on the outside. Shoo Fry uses potatoes imported from Canada to give it that authentic taste. The fried egg topped with pepper and cheddar cheese were a great combination on top — as was the scrapple, which was cooked perfectly. Mixed together, it tasted like a breakfast (if you were to whisk your eggs, scrapple and home fries all together). Unorthodox but very tasty. PB&J poutine was the opposite of that. While I was skeptical about the scrapple one, I was proved wrong. With this, though, I was right on the money. Covered with peanut butter, grape jelly and a whole mess of actual peanuts drizzled on top, this was straight-up gross. The dish seems like something they put on the menu because it’s so way out. You know, the thing that kept P.Y.T. in business all those years. 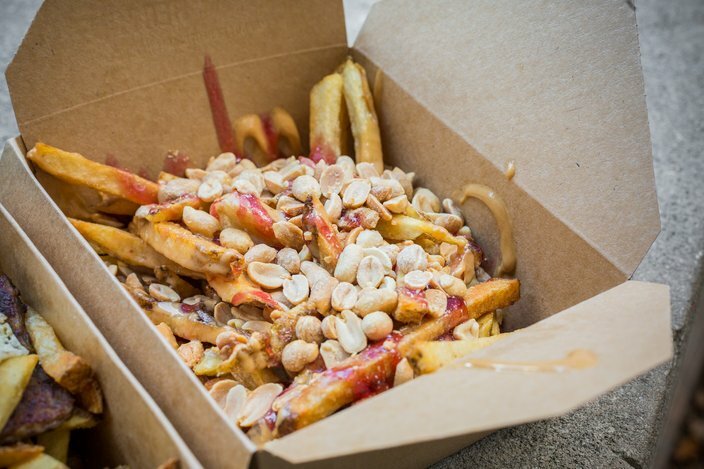 PB&J poutine is what a really stoned child would think up. It was so salty and dry with all of those peanuts that it was very hard to eat. Also, jelly and potatoes together? I don’t know, man. Verdict: Scrapple Jawn = Yes. / PB&J = No. / Poutine in general = Undetermined. The PB&J poutine was salty and dry. Putting peanuts on top was a strange choice. 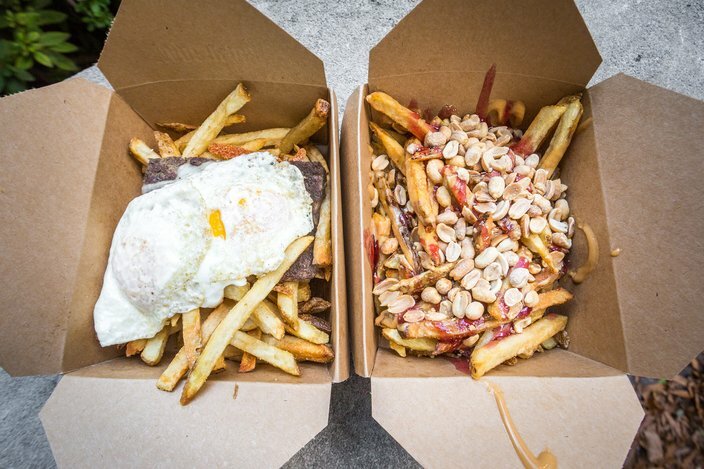 Scrapple Jawn (left) and PB&J poutine from Shoo Fry, 132 S. 17th St.